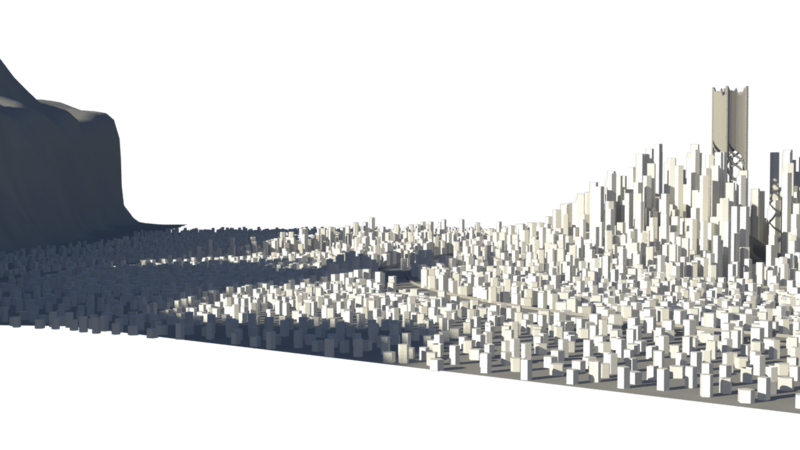 This week, I mostly worked with xGen to procedurally generate our cityscape in Maya. I also worked with Val to create the fur shader for Danforth’s hat. Summary: I set up the foundation for our city in Maya’s procedural generation plugin, xGen. It builds the city based off of a few input maps and some scripted rules; right now, it’s only scattering 5-sided cylinders but these can easily be swapped out for proper building models! Positives: The hardest parts of this are done. I’ve gotten xGen stable, all values are in the right ballpark, and I’ve figured out how to export the resulting scatter as instances so we don’t need to worry about getting xGen to work on the farm. What’s next is tweaking values and creating proper buildings to be scattered around the city. Negatives: xGen is possibly the least stable program I’ve ever worked with. I averaged a crash every 20 minutes working with it, which is why I’m so keen on exporting as instances ASAP. The sooner we’re not reliant on xGen, the better. Summary: I’ve been working on creating the shader for Danforth’s Hat’s lining, which is supposed to be a dense fluffy fur. I got it looking pretty good with displacements and a light coating of VRayFur, but it needs a lot of optimization to be viable for production. Positives: Got the look down pat, just need to make it faster now! Continue working with xGen to create the cityscape. I missed last week’s PPJ, so tonight’s will be something of a double feature. Last week, I worked with Gabe and his merry band of animators to get all our scenes ready to go with cameras, display layers, proper heirarchical organization, etc. I also worked on styling VRayFur for Danforth’s hat lining, and figuring out how to best re-generate our city in Maya. Summary: Finished placing cameras in our scenes, cleaned up the outliner, made sure everything was named sensibly and consistently, and set up references and display layers as per Gabe’s request. All our scenes are now ready for our animators! Positives: I’m free to start detailing our environments, do render tests, etc. now that the animators have what they need. Summary: I helped Val out with designing lining for Danforth’s hat. It’s supposed to be a wooly / cotton lining (see above), and I tried creating it using VRayFur. The results were promising, but not quite what we were going for… I think a blend of displacement mapping or particle scattering with a thin layer of fur for detail will be our best bet, and will test it this week. Positives: Creating the whole lining using fur is surprisingly fast, both to tweak and render. And though the look this produces is not quite right, it can easily be combined with some other elements to make a much better appearance. Positives: With XGen’s expressions and mapping system, I should be able to broadly control how the cityscape generates, and hopefully export the final product as a particle system or a bunch of instances. Negatives: XGen is very unstable (it crashed on launch several times while I was testing it), and that really scares me. I want to be sure this won’t cause any problems during rendering or for our animators before implementing it. Stress-test XGen, with anticipation of using it for cityscape. Spruce up the city and temple scenes for our end-of-term presentation! Summary: Same as last week, just re-creating our storyboards in our rough 3D environments so animation can begin. Positives: Scenes are finally moving on to the animation stage! Negatives: Due to confusion around which storyboards are the most up-to-date, as last week very little work got done on this front. Summary: We worked on figuring out the best way to compartmentalize our project and keep it neatly structured without getting redundant and difficult to manage, settling on a system using symlinks to reference folders with shared assets etc. Positives: The kinks are pretty much ironed out, our system should make switching between on and off campus computers a breeze and make navigating the project directories as painless as possible! Negatives: The renderfarm has been out of commission recently, so we can’t test our system on there. It should work, but in case it doesn’t we have a few backup plans. This week I started placing our cameras according to the latest storyboards, and also worked on making an nCloth tent that can be used in Lake’s camp. Summary: I started placing stand-in props and static cameras in our 3D scenes to match the latest storyboards, so that we can begin our pop-through animation. Even though these cameras will all be replaced down the line, they serve as a guideline for where our actors need to be, roughly what will be in frame, etc. Positives: Recreating our storyboards in 3D helped iron out some weird framing issues and highlight where we may need another shot or two to convey what’s going on in a scene. Negatives: After all our script revisions our storyboards are scattered all over the place, and it’s unclear which are the most up-to-date. Because of this, I was only able to work on cameras for two scenes. Luckily, this will be a non-issue once we round up all the latest boards! Summary: This tent is several cloth sims combined together, and could serve as the basis for the tents around Lake’s camp. Because of the way it is set up, any part of the tent that doesn’t interact with our characters can be simmed and saved out ahead of time, so that only the flaps, for example, have to be re-simmed after animating. Positives: It’s a surprisingly stable and fast sim, considering all the interacting pieces of cloth. It should be easy to continue adding on to. Negatives: It’s not fast enough to sim in real-time, so when animating with it we’ll have to make adjustments, bake the sim, and see how it looks. This week I worked on *drumroll* laying out our city environments! Summary: The city scenes are all layed out and ready for animation – that’s the temple, exterior ancient city, and mountain pass scenes – as well as the intro cave scene. With our script finalized (finally!) and new storyboards pouring in we’re in great shape to start laying out our shots and begining our pop-through animation! Positives: See above; but really, everything’s starting to solidify and we’re about to really start moving forward on this thing. This week I went back to working on layout for our city environments, mainly finishing the Temple rough-in. Summary: I’ve almost finished the rough Temple environment, with only a few key details left to be worked out. With our final script taking shape, I’ve also begun work on the other city scenes. Our goal is to have a first draft of all environments roughed in by Wednesday, and I think we’re on track for that. Lake’s camp and the Temple are the most complicated environments by far, and they’ve been worked on for the longest (by Ethan and myself, respectively). Positives: v01 of the Temple is nearly ready for animation; the floor just needs some more polys and one key detail needs to be worked out. The other city environments have been started, and should move along much faster than the Temple environment. Negatives: Not much this week, now that the script is nearing finality we can lock down the remaining environments pretty quickly.